It’s Saturday, so instead of our usual writing tip we’ll have some fun. The image below appeared on Deborah Ng’s Google+ (Google’s social network) stream yesterday. Nice huh? For those who can’t see the image, the first line says: “Let’s eat grandma!”. The second line says: “Let’s eat, grandma!”. And the conclusion: “Punctuation saves lives!”. 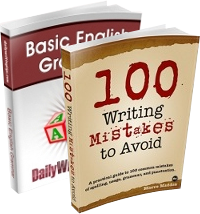 If you have similar images about the English language and want to see them featured on the blog you can send them to info@dailywritingtips.com. We might make this a regular column. I was just wondering, if images might be something that appears now and then, could they have a description in the post? I was intrigued by the post title but since I can’t see the image, I feel a bit left out. @JK, sorry about that! I just edited the post, including a description about the image. Will keep this in mind for future ones too. I love all of your blog posts. They are enjoyable to read, and I learn so many things. I love to write but never studied grammar or punctuation. I think of your posts as delicious snacks. The post today is not only very funny but also a perfect reminder to pay attention to these things when I write. Why do some people not see the image? Do they go to your web home page and still not have it come up? I’ve read several novels published in England that eliminated the comma used in direct address. Instead of “Close the door Charles,” it read, “Close the door Charles.” I asked a British friend if they were typos and he said it was becoming pretty much standard! @Lillian, there are many people with vision impairment who browse the web normally thanks to text to speech software. It’s been a long time I don’t write here, nice to see you guys are still doing this great job, I recommend your web site to all my students. That’s it !!! See y’all !!! Cheers !!! Nice, but the failure to capitalize “Grandma” detracts from the snark IMO. so damn humourous and educative at the same time. God bless u guyz for coming with this site. It’s really helpful and there’s so much to learn. Keep up the great work!
. . . “Let’s eat grandma!”.
. . . “Let’s eat, grandma!”. 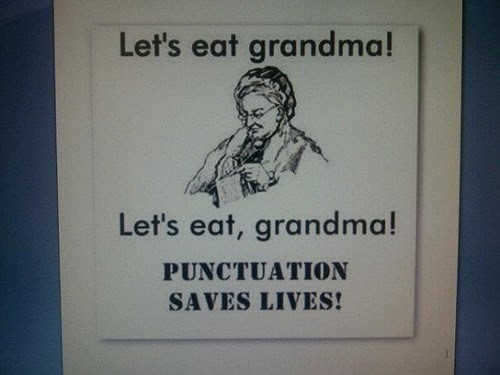 And the conclusion: “Punctuation saves lives!”. “It depends. 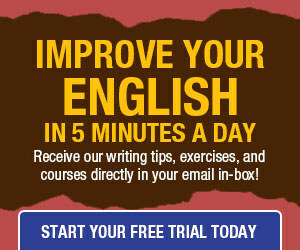 If you are writing in American English, other punctuation should go inside the quotation marks, even if it is not part of the quoted sentence. Like in that joke about a bear who enters a restaurant, and, after eating, shoots the people thare and leaves, and, when asked why he did it, says, “Well, about a bear it’s said that he ‘eats, shoots, and leaves'”.